This puja samagri pack can be used for daily Laxmi puja or during Navratri, Deepawali and for any ritual involving worshipping Goddess Mahalakshmi. Mahalakshmi is the Goddess of wealth, prosperity (both material and spiritual), fortune, and the embodiment of beauty. She bestows good luck and is believed to protect her devotees from all kinds of misery and money-related sorrows. She is also the personification of the spiritual fulfillment. The one who is exquisitely beautiful – she is Goddess Mahalakshmi. Goddess Mahalakshmi is therefore truly the Goddess of wealth. “Lakshmi” also means compassion. We have assembled in this pack all the essentials for worshipping and pleasing Goddess Mahalakshmi. This pack can be used for daily Laxmi puja or during Navratri, Deepawali and for any ritual involving worshipping Goddess Mahalakshmi. •	Ganesh Laxmi Saraswati photo frame. •	Coin of Ganesh Laxmi Saraswati. •	Kuber - Laxmi Puja book. 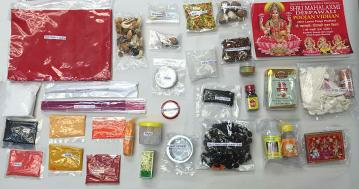 Packaging: All items are labeled and packed in a tight and secure plastic bag. This item in Hindu Puja Items category was first added to our catalog on 09-19-2016. Buy Mahalaxmi Puja Kit \w Silver Coin & Lakshmi Pooja items, sold & shipped by Movie Time Video where you can shop online for Pooja Mandir, Bajot, Gifts, Hindi Movie DVD / CD, Music Video. This Puja Samagri collection has been tagged as Mahalakshmi puja kit, Hindu religion, worship spirituality, diwali poojan readymade pack, Hindu portal, Diwali Puja Samagri.